Ideally located in the coveted Seaview Elementary area of Edmonds. This spotless and spacious 3 bedroom 1 bath rambler will exceed your expectations. 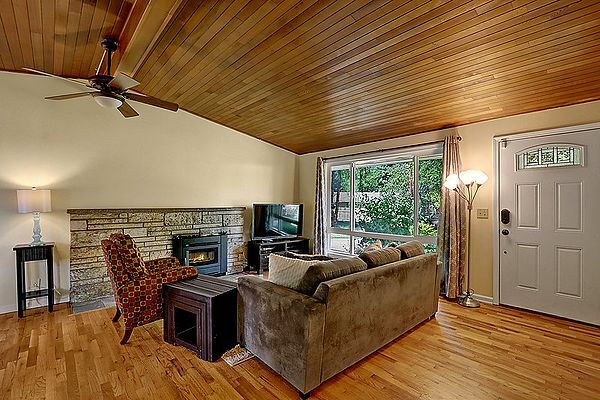 Gorgeous vaulted wood ceilings, new paint, extensive use of hardwood and tile flooring. Updated eat in kitchen with SS appliances, two fireplaces, remodeled bath and additional room for pantry, small office, or wind cellar. Seton a HUGE 13,000+ sq ft lot with fruit trees, garden space and so much room to play! Close to parks, shops, and only minutes to Downtown Edmonds. Room to expand and add equity!